Positive are delighted to announce that we have been ISO 9001 & ISO 27001 certified for another year. We first achieved the internationally recognised ISO 9001 & ISO 27001 accreditations back in 2016 following an independent assessment by the British Assessment Bureau. ISO 27001 is the Information Security Management Standard. Accredited organisations assess and prevent information security risks and safeguard their customer’s data and information. Whilst ISO 9001 helps improve consistency, efficiency and productivity within organisations. Both ISO 9001 & ISO 27001 certified organisations are committed to continuous improvement and are assessed annually to ensure progress is being maintained. 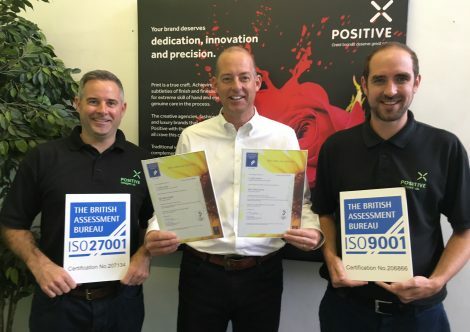 Following a successful annual audit, Positive has earned the right to continue to display the coveted British Assessment Bureau ISO 27001 & 9001 certification marks, which demonstrate conformance to the ISO standard. Danny Sullivan, Managing Director said “We are particularly pleased to be ISO 27001 certified for another year, as it demonstrates that we have the correct processes and controls in place to keep data secure. This is particularly important for our new multichannel service as well as our established direct mail service”. Just last month Positive also gained FSC recertification. Positive provides Print, Direct Mail and Multichannel Marketing solutions. All of our services are carried out in-house to ensure the highest quality from start to finish. Whether you need to simplify processes, get to market quickly or just want to ensure you achieve your revenue goals, we can help. Image shows company directors (left to right) Mike Sullivan, Danny Sullivan and Jay Sullivan with their ISO certifications. If you’re interested in completing the ISO certification, contact ISO Certification Consultants.